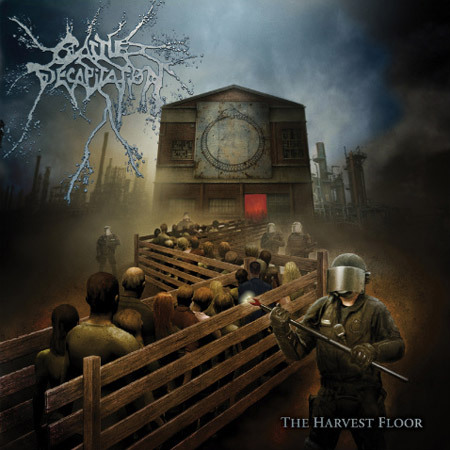 San Diego extreme metallers CATTLE DECAPITATION have set "The Harvest Floor" as the title of their new album, due in early 2009 via Metal Blade Records. The drum tracks were laid down with Zach Ohren (ALL SHALL PERISH, DECREPIT BIRTH) before the rest of the instruments were recorded and the entire thing was mixed with producer Billy Anderson (MR. BUNGLE, MELVINS, SWANS) at Sharkbite studios in Oakland, California. According to the group, "Sonically, the band has managed to finally capture and accentuate its live intensity that we've become known for and has created one hell of an album from start to epic finish! Conceptually, its misanthropy shall go unmatched. This is it, humans... ferocity at its finest." Regarding the album title and packaging, the band states, "The actual title refers to the area of a slaughterhouse where the animal (of course in our case it always means the HUMAN) begins the agonizing process of death, usually done with a bolt to the forehead or a slice to the throat. 'The Harvest Floor' is a fitting title for an album laden in gore and the anti-human metaphors and sentiments CATTLE DECAPITATION fans have grown to know and love. Artwork [see below] by Wes Benscoter shows the outside of a large slaughterhouse/factory of doom and gloom with the general public being herded inside to meet their demise. The inside of the album layout reveals what's really inside that slaughterhouse: our misanthropic heroes of GORE (not core) at another hard day of work! Combined with the amazing artwork and conceptually brutal layout, 'The Harvest Floor' also contains an enhanced portion which sports an iPod-ready documentary titled 'Pandemic: The Damnation Epic - The Making of “The Harvest Floor' which, simply put, makes 'The Harvest Floor' an apocalyptic multimedia epic! The CD features guest vocal appearances by Ross Sewage (IMPALED, LUDICRA) and Dino Sommese (DYSTOPIA, ASUNDER). There is alsoa special appearance by Jarboe (SWANS), lending her beautifully haunting voice to the epic death dirge "The Harvest Floor". Jackie Perez Gratz (GRAYCEON, AMBER ASYLUM) graces a couple tracks with her electric cello and Los Angeles noisician John Wiese also lends his electronic/atmospheric expertise to the album, further separating the band from the typical "cookie-cutter" approach applied all too often by today's extreme acts. Sick Drummer magazine recently posted video footage of David McCraw of CATTLE DECAPITATION laying down tracks for the band's upcoming album. Watch it below (courtesy of Metal Injection).